"Midway through the set Young demanded we 'read the label' and then ripped his t-shirt down the middle to reveal a green 'Go Family Farms' logo. 'It's a big complicated mess,' he'd say later. 'I don't have time to tell you about it.' Indeed he didn't, so there'd be no extended soapbox free associations, just a scowling 'Everybody Knows This Is Nowhere' and a lovely, cautionary 'Comes a Time.' But then Shakey was gone it seemed before he ever really got started. 'Support family farms! We're too small to fail!' 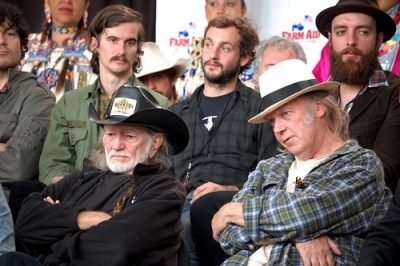 They are, but for all of Farm Aid's good works, the field of opportunity is shrinking fast." "Young graced the crowd with opening song “Sail Away,” as well as “Long May You Run,” “Field of Opportunity,” and “Hold Back the Tears,” which he explained had nothing to do with farming. Young further cemented his name as a necessary Farm Aid staple during his set with statement after statement in support of family farming. “We’re here to make a difference and you can make it without us, but you’ve got the biggest vote with your dollar bill,” said Young, wearing a Stop Factory Farming T-shirt. 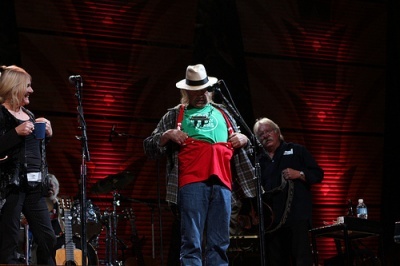 Talking about his own wardrobe malfunction, Young ripped his T-shirt to reveal a green Go Family Farming T-shirt underneath, then welcomed Nelson on stage with him for “Homegrown,” where they sang of planting that bulb and letting it grow." Neil Young will be performing today at the Farm Aid 2009 concert in St. Louis, Missouri at Verizon Wireless a giant corporation amphitheater. More Twitter tweets from Farm Aid below. 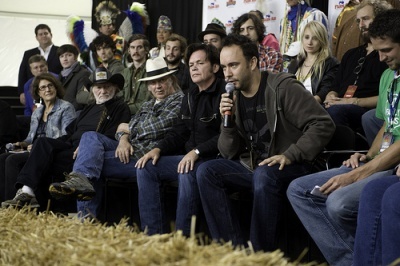 More on last year's Farm Aid 2008 Concert. 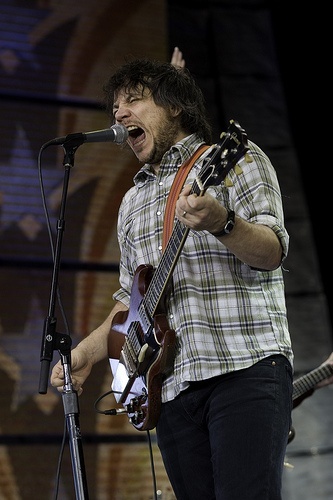 Wilco is the best band in the world. and one more sign is a beautiful song. uhh Ryan Bingham and the Dead Horses, very cool news ! Know Your Giants: The effort is to be applauded-of course. Horizon Dairy is a co-sponsor, and they are organic, so it must be good-right? Like everything there is another side. Horizon Dairy is owned by Dean Foods, 'some' major shareholders of Dean Foods are, Exxon/Mobil, Phillip Morris, WalMart, and GE. Know your sponsors for 'They Might Be Giants. Well, I wish I were there anyway. Brought to you by Sour Grapes-DAMN! DIRECTV's The 101 Network will be broadcasting Farm Aid 2009 Presented by Horizon Organic live in HD, commercial-free, and in surround sound. The show starts at 5pm EDT on Sunday, October 4. We'll be playing the concert live on this website starting at 5pm EDT on Sunday, October 4 in a webcast brought to you by EternaGreen™. We'll also be featuring exclusive photos from the show and featuring your comments from Twitter on our webcast page. Come back to this page on Sunday for a link to the webcast! Sirius XM Radio will broadcast the concert live starting at 2pm EDT on Sunday, October 4. Tune into Willie's Place, Sirius Channel 64 or XM Channel 13, to hear the show! 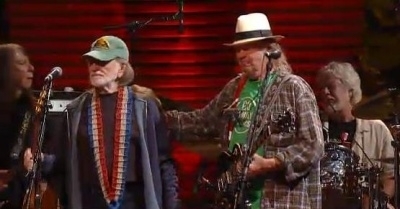 Willie Nelson's son played an amazing version of Neil Young's "LA!" Man I just gotta say.That's a beautiful ramshackle version of Everybody Knows.And Willie played some tasty ge-tar on Homegrown as well. Not wanting to stir any bad stuff up, but was I the only one who noticed that Pegi basically ruined last night's show? She needs to accept that her voice is very detrimental to Neil's and let him do his thing alone. I love back-up vocals but Neil's voice was sooooooo great last night and all Pegi's voice did was hamper the energy in my opinion. And did I notice Neil cringe a few times during some of those back-ups? Mark, you weren't the only one to notice it. Considering that Neil has been graced by some legendary female back-up singers (Ronstadt, Harris, Larson), it's kinda sad to see him accompanied by a less-than-adequate vocalist in Pegi. She seems to be taking on a more and more prominent role in the whole "act" every time I see Neil perform. It's not beneficial to the music. The more you complain about her, the more she's gonna be here, there and everywheret. I have total respect for Pegi but I agree about her singing. She`s often out of tune and sings too loudly, drowning Neil out. 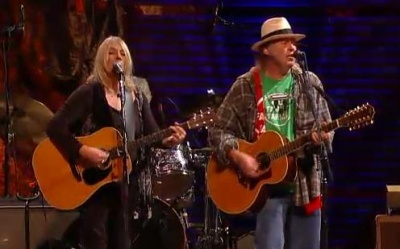 It obviously makes Neil happy having his wife singing with him but the fact is she just can`t sing! i have a feeling that these benefit shows haven't had a tremendous amount of rehearsal. not superb at the past two shows, no... but i think she has been on-point during the tour stops of the past few years. It wasn't just Pegi. Both she & Ben were a little outta tune this time and at Sarah MacLachlan's benefit. Crawford's voice blends really well with Neil. Maybe that's what we were missing the last few times. I have a question, if anybody happens to know the answer. Neil played ALREADY ONE last night and I'm wondering if its performance is a reference to some personal milestone like perhaps him having a now one year old grandchild? Since I hadn't heard about Amber having a child previously, it would be a surprise. Certainly really none of my business, but he did play the song, which left me "Wonderin'". Umm, in response to the last comment, the song "Already One" is not a reference to a child being one-year old. It's a reference to the bond that indelibly attaches to a man and a woman who have had a child together, even when the marriage (or relationship) between the two is disintegrating. 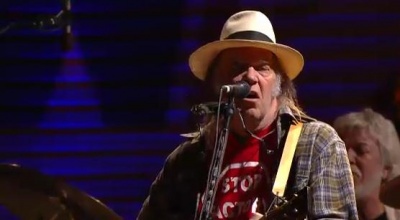 And lest we not forget about the cause.If you're able.Support Farm Aid. When given an opportunity, take it. I think Neil's wardrobe malfunction simply highlights his clever instincts, sarcasm, and synicism with 'playing the roll' without playing the fool. He always seems to be able to make a point and use something known to make something new. He took out the negative (Stop) and put out the positive (GO!). That's what separates him from the other 'Artists' in Rock and Roll. ..and the 'artistry' is not done on paint and canvas(ok-film), but by smarts, perception, communication, humor, poignancy, and direct address. RE: Cringing during the set. Maybe it was because Neil left off a whole verse to EKTIN???? Correction.......Neil did not leave off a verse, the cringing started because Ben "Longrain" Keith was still singing LA LA LA LA when Neil was trying to do his first guitar jam solo and then both Ben and Pegi did it again during his 2nd attempt. NOTE TO BAND: when Neil starts to let OLD BLACK sing a solo. SHUT UP! Yes, the backing vocals were way off, especially grating when the originals were so beautiful. His voice still is fine, but he has to exercise a bit more critical stewardship of his entire crew's performance. I think he has allowed a very awkward situation to develop. Pegi should back off a bit, and he should really seek out a new Nicolette Larson/Linda Ronstadt to do his harmonies justice. Not to come across as too negative, but Neil needs to change his act. His current band has been with him for too long now and it's getting old and tired. I love Ben Keith and Spooner as much as the next guy, but they too often come across as comatose on stage. There is a lack of chemistry and excitement. He needs a band that will challenge him and bring a renewed energy to his music. It's obvious. I think what was missing was Anthony Crawford's blending harmony. I think Pegi is looking more and more like Luna Lovegood. Or maybe Luna Lovegood is looking more and more like Pegi.